This blog was started by copying some texts from my Ms thesis about 3d plant generation. So here you will find everything regarding 3d Plants. and some famous tree, which is probably not related to burls, but still very nice. Cankers are dead areas of bark, caused by fungi and bacterial infection. 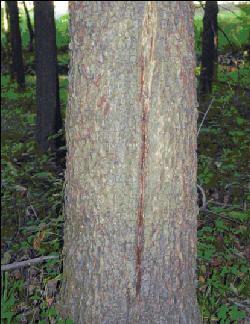 Cankers can be found on branches as well as on tree trunks. Such an infection can cause a draw back in annual branch or twig growth. Yet on the stem it can create visually interesting formations which can be deadly to a tree. Organisms which cause a canker formation can enter and infect the bark through wounds. These wounds could be caused by broken branches, or insects which have caused an injury. 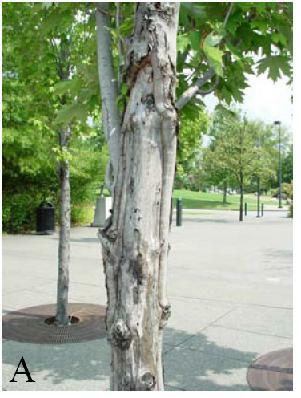 When canker pathogens pass through the outer bark barrier, they can colonize other bark tissue. 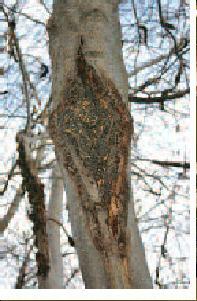 Cankers can enhance wood decay, and cause branch breakage or tree death (Tisserat 2004). Some trunks form a unique shape and architecture. Trunks of Ponderosa pine grow twisted. 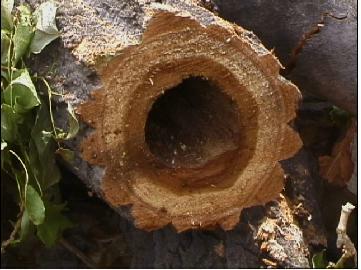 If the bark is removed, the spiral architecture of the trunk’s wood can be observed. There were many theories regarding reasons of such growth behavior. Seubpong Leelavanichkul and Andrej Cherkaev suggest, that the reasons could be mechanical, showing the strength of twisted and normal wood structures (Leelavanichkul and Cherkaev 2004). Regardless of the reason of such unusual wood architecture, it has a strong implications to be considered in the creation of visually interesting trees. There are many insects, which feed or live in bark and tree trunks. Mainly these are insects from the beetle, to the moth and horntail wasp groups. Usually only weak or dead trees are attacked. The insects which attack healthy trees are called “primary invaders”. “Secondary invaders” are insects that start living in a tree only after the tree has already been strongly damaged by other hazards or diseases. Secondary invaders are of the previously mentioned species, but also include termites, carpenter bees and carpenter ants. Insects can not only harm a tree but also kill it. Usually the presence of such invaders is only noticeable after parts of tree start to tear off the main structure and tree starts to die. Many of such insects produce sawdust like particles which are excrements (Buss and Foltz 1993). Frank Hale. 2007. Drought and Wood-Boring Insects, Ornamental Pest and Desease Update, UT Extention. It has been noted that weakened trees are sometimes heavily covered with moss. The reason for this is that such trees often loose big amounts of leaves, which allow for more light to reach the trunk and branches’ surfaces. The increased light makes moss grow very fast (Gilman 1991). 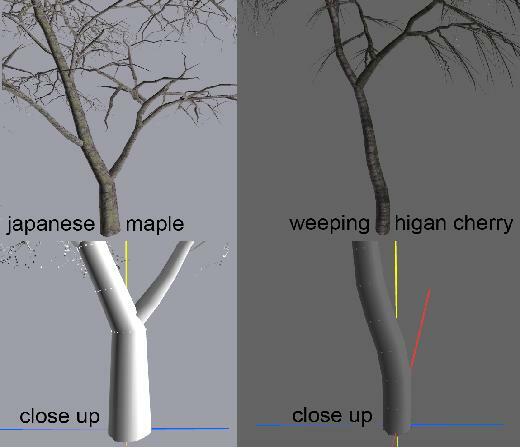 While it is not a tree defect, it should be addressed when wanting to model visually appealing trees. Trees can be severely injured by fire which could be a normal forest fire or a fire resulting from lightning. Bark serves as a protection layer. It is a low conductor of heat, and saves inner layers of wood from fire. Bark protection is different amongst different tree species. The Bark’s texture and shape also has an influence on its’ fire resistance. Cross sections show that trees after a fire with thicker bark, haven’t been badly injured, while thin barked Red Maples were more frequently and severely damaged. The majority of the trees survive fire damage, and only small fire wounds are left. Usually trees manage to grow new wood layers, and therefore hide burned wood. Well defined injury boundaries usually result from a successfully stopped decay. Small and well defined wounds usually are surrounded by healthy new layers of wood (Smith and Sutherland 2006). There are various factors which influence the look of trees. This might include weather conditions such as sudden cold or lightning. Various diseases can change the way a tree looks in many ways. Insects behaviors also are a reason tree’s visual characteristics change. What follows are some important factors for regarding a tree’s appearance. If the temperature rapidly changes, the tree bark and wood can crack. The cracks might appear in a place where there is already some type of internal tree defect. When the temperatures change very fast, different layers of wood contract and expand at different speeds. This difference makes wood crack. Usually, in the summer cracks heal themselves by growing a new layer of wood, but a crack usually reappears subsequently in winter. This leads to the formation of so called “frost ribs” or “seams”. Often such cracks appear close to the ground, and provide an opportunity for disease and insect penetration, which later results in the tree rotting (Seifert and Woeste 2004). A surface crack called “Winter Sunscald” appears when the sun heats the tree bark, and at night time when the temperature dramatically changes. Such wounds kill the inner layers of the bark. The thinner the bark, the less the winter sunscald affects the tree (Anonymous. 2006). Lightning strikes do not necessarily kill a tree, but usually the damage is considerable. The damage could be in the form of burn marks or cracks in the trunk and exploded bark. Usually such trees are removed, since most of the defects mentioned above lead to the slow decay and death of the tree (Seifert and Woeste. 2004). 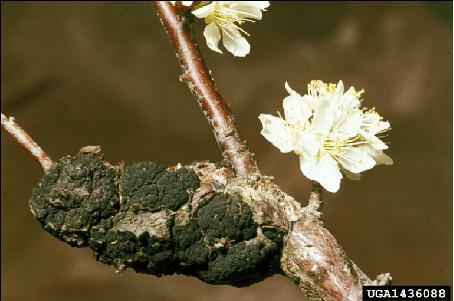 Black Knot “Apiosporina morbosa” is a disease which is mostly found on plum and cherry trees, which can be wild or cultivated. The disease makes black knots with an irregular shape in the wood tissue. The sizes vary from 1.3 to 30 centimeters. Black Knot is not found in Europe, but it is still common in parts of North America, particularly Northwest parts (Wek and Draper 2006). Black knot is caused by the fungus “Apiosporina morbosa”. From the start of a wood infection, it usually takes two years to fully develop. The infected branch will most likely be killed, while a knot on the main stem most likely will not kill a tree (Wek and Draper 2006). Becky Wek and Martin Draper. 2006. Black Knot of Stone fruits. South Dakota State University, South Dakota counties, and U.S. Department of Agriculture cooperating. so this small post is interesting regarding 3d tree generation, while forestry “science” has arguably collected biggest amount of knowledge regarding tree trunks. therefore if we know the terms they use we can much easier navigate and find info it has gathered in last hundreds of years. Forestry, as any other science practice, has developed its own terminology and jargon. In this section, some important terms for this thesis from forestry terminology regarding tree trunk formations and defects are defined. A crock is a formation in a branch or a trunk which is characterized by a sharp bend in the main stem. A tree trunk with a crook will most likely be as strong as one without a crook. Crooks form in trees as a part of the normal development process. Later in a tree’s development process this problem is usually corrected (Kays and Tjaden 1999). Roots are the part of a plant which is usually beneath the ground, and serves as a food store, and mechanical support. Also, minerals and water are being absorbed by the tree through the roots. The shapes of roots vary. Oaks and Pines, when grown in sandy and dry soil, develop so called tap roots. Tap roots are roots which grow directly beneath the trunk. Usually, urban trees do not develop such roots, and they are not common if there is enough water in the ground (Perry 1982). Roots don’t follow a specific growth pattern rather, they grow where there are more minerals or water. Since roots also need oxygen, most of them do not grow very deep. Also, roots do not grow where the soil is very hard as they tend to avoid such areas. The area that the roots occupy is usually bigger than the size of the tree canopy, sometimes it may be as big as the height of the tree, but in many cases it grows 2 or 3 times bigger then the tree’s height in first 3 years of planting (Perry 1982). In trees such as Oaks, there is a strong connection between the root’s position and its’ leaves. If the roots are injured the tree will drop its’ leaves at the same side where injury took place, while trees such as Maples loose leaves on random branches. The majority of tree roots are situated very close to the ground’s surface, which makes trees vulnerable (Gilman 1991). 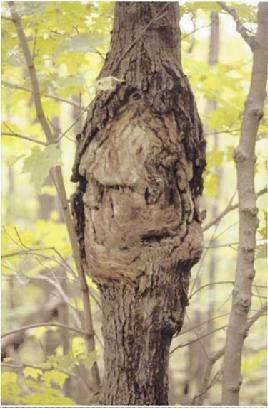 A griding root is a common reason for a Maple’s decline. It is a root which grows around the main trunk. As the trunk and the roots grow bigger in diameter, it starts to strangle the trunk. This strangling disturbs the mineral and water flow from the root system to the leaves, and becomes problematic for the tree. It can eventually lead to a tree’s decline, or in some extreme cases, to its’ death. A griding root is not limited to but usually effects human planted trees, and it happens because of the way the seedling was planted. Therefore one should be careful in root positioning when planting a tree (Forest Resources Extension). Another reason for a tree’s decline is a situation where the roots are visible above the ground. This is caused by erosion. This occurs most commonly when a tree is growing on a hill. Also in soil, which consists of clay based materials, a tree can be prone to erosion. Weather conditions also contribute to exposure of the tree’s roots. Trees with exposed roots are not so resistant to dry out periods which contribute to possible tree decay or death (McAuliffe et al. 2006). ok, so i thogt this chapter is not that inteesting to post in blog originaly, but when u think better, why not? next couple of posts will talk about tree and its biology. And most importantly tree diseases and things that affect tree look. Basically all stuff that makes trees visually interesting and which are not simulated in tree generators. When considering Virtual Tree Generation, it is important to understand what is the biological nature of a tree. In this chapter, important biological elements and processes related to trees will be discussed, which are important in some way for tree modeling. un branched. Usually a tree is divided into three major parts those are the crown, trunk and the roots. The crown consists of branches, twigs, and leaves. Trees do not heal their injured tissues; instead the cells of injured tissues change and become a barrier for diseases and further decay. The layers of new tree tissues usually cover a wound. The changed wood tissue is called a “reaction zone”. In many tree species it is easy to recognize, this wood as it is often darker in color compared to healthy wood tissue (Whiting et al. 2005). A trunk is commonly defined as the main stem of a plant which serves as a support for leaves and a connection with the roots. The trunk also serves as a water storage tank, for example in the case of baobab trees. Water and minerals collected through roots are then transmitted through the trunk to the leaves. The trunk itself consists of two main types of wood. The Xylem is a supporting wood, and Phloem is wood for water transportation (Whiting et al. 2005). Fig 4.Wood layer structures. Picture taken from: David Whiting, Robert Cox, and Carol O’Meara; 2005. Tree Growth and Decay. GardenNotes #611. The bark of a tree serves as a protective layer from different types of damage and the Phloem is a tissue beneath the bark. The main purpose of the Phloem layer is to transport sugars and carbohydrates produced by leaves and to feed the roots. 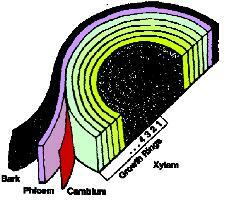 Xylem is a wood tissue which acts as a supporting material for the whole tree. Wood which grows at the beginning of summer is used for water transportation inside the tree. If enlarged, its structure remains tubular in its shape, while tree tissue which grown at the end of summer is much more dense in its structure and serves as a support material for the overall tree (Whiting et al. 2005). The “reaction zone“ does not always stop decay. Decay can easily advance in Xylem wood tissue which grows in early summer and serves as a water transportation system inside a tree. If the reaction zone would stop decay effectively, it would also plug Xylem tubes. As a result, the water supply inside a tree would be compromised and the tree would die (Whiting et al. 2005). Fig 5. Decay creates a hole in the center of a tree. The darker area is a reaction zone. Picture taken from: David Whiting, Robert Cox, and Carol O’Meara; 2005. Tree Growth and Decay. GardenNotes #611. 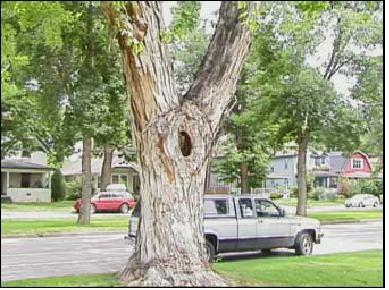 When the wall of a trunk has a hole which leads to empty space in the center of the trunk, the tree becomes coincidentally weaker, and is considered hazardous. Tree holes are candidates for many flora and fauna species to use as a home. Figure 6. The strength of a tree is strongly reduced by a hole. Picture taken from: David Whiting, Robert Cox, and Carol O’Meara; 2005. Tree Growth and Decay. GardenNotes #611. There are two main types of trees according to how new layers of wood grow. The first is “Exogenous” which are trees that grow outwards; meaning each year a new row of wood is being placed on the outside of the existing trunk beneath the bark. The other type is called “Endogenous” which, unlike the “Exogenous”, places new layers inside the trunk. While most trees belong to the Exogenous category, others like Palms, Dragon trees and Cacti grow by extending themselves from inside. Usually each new layer of wood grows in one year, but that strongly depends on rain periods. A growth layer which is produced in one season is called an “Annual Ring” (Bodirlau et al. 2007). By counting the annual rings of a tree one can determine the trees age. The science of tree age determination is called “Dendrochronology.” Some trees in deserts might have a new layer after each rain season, which is not necessarily regular, and some trees may produce two layers of wood a year. In tropical areas where it is always wet, the annual rings on trees might be not seen at all. While getting bigger some parts of trees tend to connect in between and become as one part. It is very likely to happened in a base of trunk and in root level under earth. Sometimes it happens to the double trunks. Some trees are goring as two, and become as one. 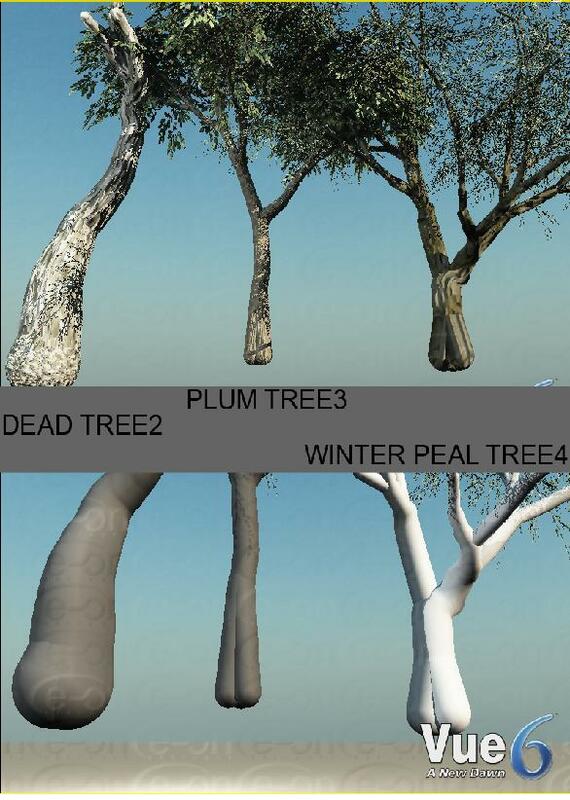 This feature might be not so relevant for realistic trees, but it sure is a good addition to more interesting and artistically more “advanced” trees. Another possible way of tree trunk detalization could possibly be done by meatballs usage in the trunk surface generation. In most of current day available 3d packages, metabals (aka: inplicit surfaces blob mesh) are common modeling technique. Also, we are not limited by using metabals, as a controllers for newly created “blobby” looking mesh, but we also can use already made 3d model – which would act as a matrix of metabals. Usually metabal creation tool would interpret each vertex of the model as a controlling metabal, and in such way we would use reference model of lower 3d detail, to create metaball surface. 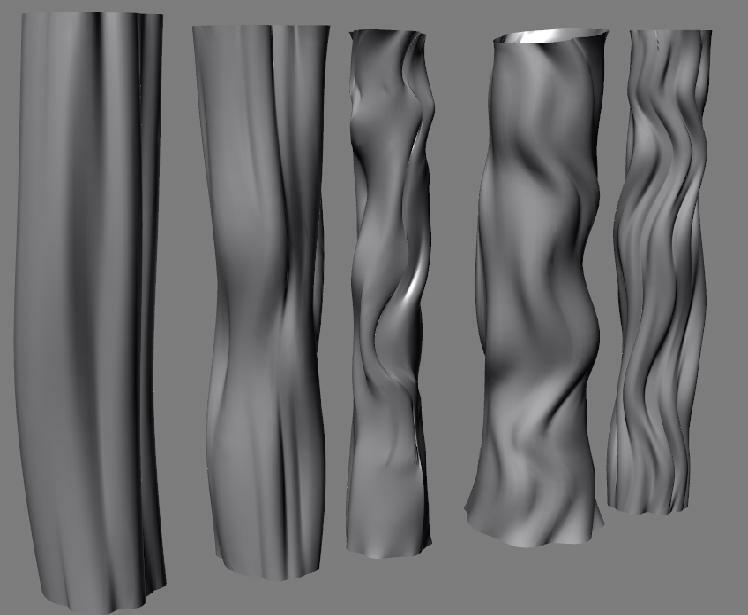 If we would take our generated tree trunk surface, and use it as a reference model for metabals creation, we would achieve automatic metalization, of surface which would follow general surface outlines. The ideal solution would be to get easy control over each metaballs threshold values. usually metaball tools lets us to set threshold values only to all set of metabals, and restrict us of having different values for each metabal. it would be very beneficial to overcome this limit. Also would be nice to set different resulting mesh density settings for each metaball. Currently the setting works for all metabals which are in a same set. That means if one sets certain value of mesh density average distances from vertexes in all resulting mesh will be almost same. In some case we don’t need high detail inside of tree, or some areas which are plain and do not have much variance in surface. This is not currently available feature of metabals and would require further investigation, probably new metaball creation algorithms too. The “work around” in case of making additional polygons in flat areas, which are not needed would be after creation of surface, to apply a mesh optimization algorithm, which would try to reduce polygons where they are not needed. The bad thing about this “work around” is we spend double time generating unnecessary polygons and then trying to remove them. Also in some cases it is good to have high detailed mesh even in flat areas if we are considering to apply displacement maps at the render time or before. common disadvantages of current metaballs algorithms is creation of so called bad mesh topology. Also if there is a polygon in a mesh, which vertex distances are much bigger then the average of the models vertex distances, the resulting surface after applying metaball operation would result a hole in a mesh at the given polygon. ok, sorry for such long scilence. i was away, abrod, home and so on….. The following figures show some tree trunks generated with Vue6 personal learning edition and trunks generated with Xfrog 3.5 demo version which will be shown in comparison with some models generated with by the automatic tree generator which I propose in this thesis. In this method a more advanced hole generator approach is used whereby holes are created at the intersection of big branches. The first potential place is the trunk and first branch intersection. The further the branching is from the trunk the less reason for a highly detailed model, therefore there should be a limit, and intersections between small branches should not generate holes and cracks. Another good position for possible holes could be the beginning of the roots whereby a hole is determined in an area where most of the vertices angles are low also in places where the roots meet the trunk’s surface. Now that I have described the tools and two possible methods for hole detection I will provide the necessary steps for this process. The proposed process of hole generation is based on 3d studio max 9 work flow and tools, but could be easily implemented in any other 3d modeling application or created as a stand alone solution. For the sake of simplicity random vertices on a polygonal plane will be used, instead of vertices with low angular levels in tree trunk model. The first step in hole generation is to select a candidate vertices group, which should form a hole. After the selection is done a chamfer tool is applied. The value which describes the distances where new vertices are created, could be half of an average edge length of selected vertices’. The next step would be to connect newly created vertices via the chamfer tool. 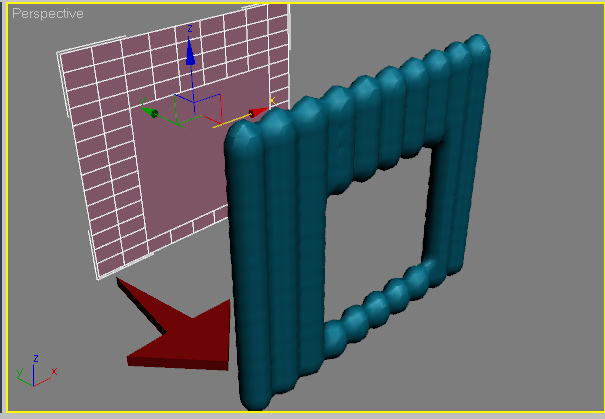 The connection tool creates new edges between newly created vertices. Edge selection is converted to a polygon selection. See figure 33 where it describes the fourth step. Fig 33.first four steps in hole creation. The red dots represent selected vertices, red lines selected edges, and red shaded area represent selected polygons. polygons. Polygonal selection should be shrunken to get the desired result. This is shown in Figure 34. The next step is to erase all selected polygons, and select the remaining edge outline and conduct an edge extrusion. The last step shown in Figure 34 represents a subdivision algorithm applied on a mesh. The subdivision algorithm not only generates more detailed mesh structure, but also softens the edges of it. The steps I have described are rather easy to perform due to the ability of 3d studio max to remember the last used selection and convert vertices selections to edge or polygon selections. This process should be possible in any 3d modeling software, but it might include a different order of steps, or additional steps required to achieve the same result. Figures 33 and 34 show steps which are very easily preformed manually. But the steps are also simple enough so that the actions could be automated. To manually create a hole as shown in Figures 33 and 34 it took around 5 minutes. But if a real trunk model was used with high mesh density and many holes to generate, this process could be very long. My recommendations if implemented would decrease the amount of time involved in current tree generation.